Read on to hear more about Dr. Sinclair’s research interests and how her students are asking questions which have her expanding her work to consider social media, such as Facebook. Lisa Sinclair is a Professor in the Department of Psychology. Her love of psychology started at the University of Winnipeg where she earned a B.A. Honours (1993) in psychology. She then went to the University of Waterloo where she earned a Ph.D. (1998) in Psychology. 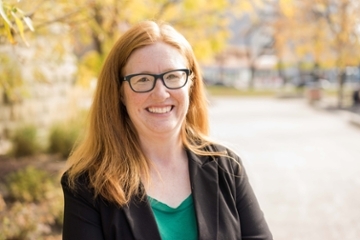 After holding a SSHRC postdoctoral fellowship at the Institute for Social Research at the University of Michigan, she turned down a tenure-track job at the University of Manitoba to return to the University of Winnipeg in 1999 as an Assistant Professor. One of Dr. Sinclair’s main motivations for returning to the University of Winnipeg was the opportunity to work with curious undergraduates. As a former first generation university student, she mentors first-generation university students and students from other backgrounds underrepresented in higher education in her lab. She has supervised over 70 undergraduate research projects, a number of which have led to conference presentations and publications for students in her lab. Recently, her students have gotten her involved in expanding her research interests to social media. Recent undergraduate theses have looked at the effects of texting on memory and on personality traits and values as well as the role of Facebook in social comparisons to idealized relationships. Dr. Sinclair teaches undergraduates courses in introductory psychology, social psychology, the psychology of gender, and the psychology of prejudice and discrimination as well as a high school enrichment course on social psychology and the power of situations. In 2016 she was awarded the Faculty of Arts Excellence in Undergraduate Teaching Award. Dr. Sinclair is a social-cognitive psychologist whose primary research focus is in the psychology of stereotyping and prejudice. In NSERC funded research she has been examining how different goals such as protecting one’s self-esteem or self-interest can lead people to use or suppress stereotypes. Currently, she is exploring the role of compassion in prejudice reduction. In published work with Dr. Beverley Fehr she has shown that compassionate love is related to more positive attitudes towards immigrants and other stigmatized group. In related work with Dr. Paul Trapnell, she has found that self-compassionate people show greater prosocial concern toward outgroups. Dr. Sinclair strives to bring her research expertise to her committee work. She currently co-chairs the UWFA Women and Equity Committee with Dr. Michelle Owen and sits on the University Employment Equity Committee. At the national level, she has served as President of the Social and Personality Psychology Section of the Canadian Psychological Association.